Each spring, usually the 3rd Saturday in May, the Friends of the Sunderland Public Library,Inc. runs a book, bake and plant sale to benefit the library. 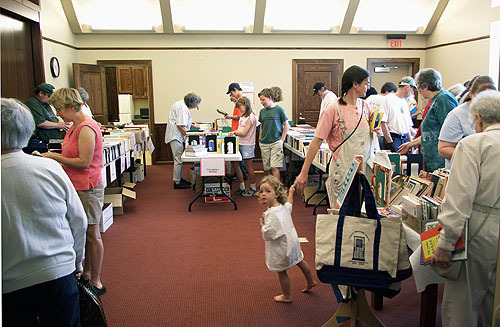 Each fall, a book and bake sale is typically held on the 3rd Saturday of October at the library. Book sale donations will be accepted up until the day before the Book Sale. The book sale is held in the library Community Room. The plant sale (spring only) is held outside the Graves Memorial Library building on School Street near the intersection of North Main St. The bake sale is run by the Library Trustees in the lobby of the library. Book prices are currently $2.00 for hardcover books; $1.00 for large (trade) paperbacks, CDs, and DVDs; and 50 cents for small (mass market) paperbacks and children’s books. These prices are subject to change without notice and do not include some specially-priced books that may be of greater value. During the last two hours of the sale, shoppers can fill a grocery bag full of books for only $7.00. Books, DVDs, and Books-on-CD may be donated year round. The Friends accept new or gently used fiction and nonfiction books. We accept almost anything that is in good enough condition to re-sell, including recent textbooks and encyclopedia sets (published within the last 10 years), and antiquarian books. We generally cannot re-sell older textbooks, outdated encyclopedias or computer software, travel guides more than a few years old, Reader’s Digest Condensed Books, or books whose covers have been removed. We regret that we can no longer accept donations of VHS-format videotapes or audio cassette tapes, as these no longer sell well. Please respect the library’s permanent collection and the health of our staff and volunteers and do not bring any moldy or dirty books into the library! If you would not display a book on your coffee table, chances are we can’t sell it and will have to pay to dispose of it. Thank you for your consideration. If the number of books you have to donate exceeds one box or two shopping bags, kindly call the library to make an appointment for one of the Friends to meet you (director@sunderlandpubliclibrary.org). Large donations inconvenience the library staff and create logistical problems due to our limited storage space. Please see the Friends Book Donation Policy for more details. Please do not leave donated materials outside the library during off hours, and do not place donations in the book drop. If you can’t bring your materials to the library, please contact the Friends with your name and phone number. Someone will call to arrange a time to pick up your donation. Bake sale donations can be brought to the library the day before during library hours or the morning of the sale. Please drop off potted plants behind the Graves Memorial Library building (near, but not at the Sunderland Public Library) a day or two before the spring sale. Arrangements can be made if you wish to donate plants before those dates, call Lucy at 665-7174. They are planted in pots (ideally well before the sale). They are labeled with as much information as possible: variety name, color, growing conditions. Common plants are more appealing if they are bountiful or mature. “Gourmet” or unusual plants sell quickly and for a premium! For pots, labels or further information, please call Lucy at 665-7174 or email friends@sunderlandpubliclibrary.org. If you would be willing to receive this information via email in the future, please send a note to the above address. We promise not to share your email address with ANYONE ever! The library thanks you for your support! The Friends of the Sunderland Public Library, Inc. is a 501(c) (3) nonprofit organization. Donations are fully tax-deductible to the extent allowed by law. Your donation will allow the Friends to purchase new materials and technology for the library, as well as sponsor all of the fun programs we provide. Thank you for your support! There are two new movies, four new children's books, and one other new book.